Mgr. BUGEJA, was born in Xagħra Gozo, Malta on 1st July 1962; He entered the Noviziate of the Friars Minor on the 2nd October 1978 and his Solemn Profession was on the 28th August 1983. He was ordained priest in Gozo, on 5th July 1986; was nominated Coadjutor Bishop on 10th July 2015. He was consecrated in the National Sanctuary of Our Lady of Ta’ Pinu, Gozo, Malta, on 4th September 2015. 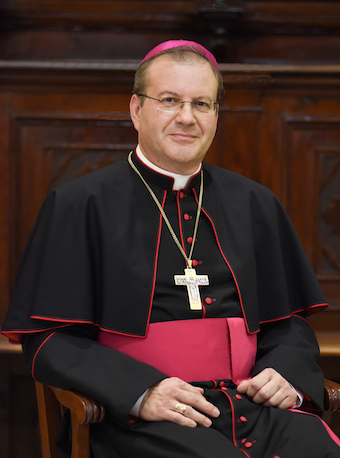 Began his ministry in Tripoli on the 23rd October 2015 as Coadjutor Bishop and Vicar General. On the 5th February 2017 he became the Vicar Apostolic of Tripoli. Apostolic Vicar Emeritus of Tripoli, Titular Bishop of Tabuda, was born in Tarhuna (Libya) on 5th February 1942. After joining the Order of the Friars Minor, he made his Solemn Profession on 25th October 1964. Mgr. MARTINELLI, was ordained priest in Salerno, Italy, on 28th June 1967; was nominated Bishop on 3rd May 1985. He was consecrated in the Church of St. Francis of Assisi, Tripoli, on 4th October 1985. He resigned due to the age of 75 on the 5th February 2017.